Join thousands of churches, synagogues, mosques and temples across the country in the annual National Observance of Children’s Sabbath celebration by holding special worship services, education programs, and advocacy activities to engage people of faith in the lives of children and their families. It is a way for faith communities to celebrate children as sacred gifts of the Divine, and provides the opportunity for houses of worship to renew and live out their moral responsibility to care, protect and advocate for all children. The theme for this year’s Children’s Sabbaths weekend, October 15-17, 2010, is Blessed to Be a Blessing: Lifting Up the Next Generation. Through worship, prayer, and actions, faith communities will affirm children as the primary blessing God has given us and commit together to working to end child poverty. Collect of the Day: On the Children’s Sabbath Almighty and everlasting God, you have blessed us with children and called us to be a blessing. In Christ who came to bring good news to the poor and welcomed the children, you have revealed your intention for justice and compassion. Prosper now the work of our hands that we may faithfully serve you by lifting up the next generation; through Jesus Christ our Lord who lives and reigns with you and the Holy Spirit, one God for ever and ever. People: Amen. For the body of Christ, that we treat every child as made in your image; that we welcome every child as you welcomed the children, and that we bring good news to the poor that you announced, let us pray to the Lord: Lord, bless us that we may be a blessing. For our nation and our leaders, grant wisdom and courage to change what is unjust and recognize that until all the children are well, none of us is well, we pray to the Lord: Lord, bless us that we may be a blessing. In a world where children hunger and starve, where they sicken and die, where they face bullets and bombs, where they know the exile of prison and refugee camp, help us protect and defend them, we pray to the Lord: Lord, bless us that we may be a blessing. For ourselves and our community, that we let our eyes weep over injustice, our hearts burn with determination, our voices speak out to demand change, and our hands move to make a difference, we pray to the Lord: Lord, bless us that we may be a blessing. On this Children’s Sabbath day, for our nation’s more than 14 million children in poverty, that we use all that we have and all that we are to raise up the next generation, we pray to the Lord: Lord, bless us that we may be a blessing. For all who have died, especially those who died too soon and too young, those whose lives were cut short by poverty, we pray to the Lord: Lord, bless us that we may be a blessing. Leader and People: God of all mercy, we confess that we have failed to live our lives as ones made in your image, we have not loved each other as sisters and brothers, we have not welcomed all children and so welcomed you, we have left stumbling blocks in the way of too many children. Forgive us our sins, as a woman searching for a cherished coin, as a father welcoming a beloved child home, and uphold us by your Spirit that we may do justice, love kindness, and walk humbly with you, through our Savior, Jesus Christ. Amen. 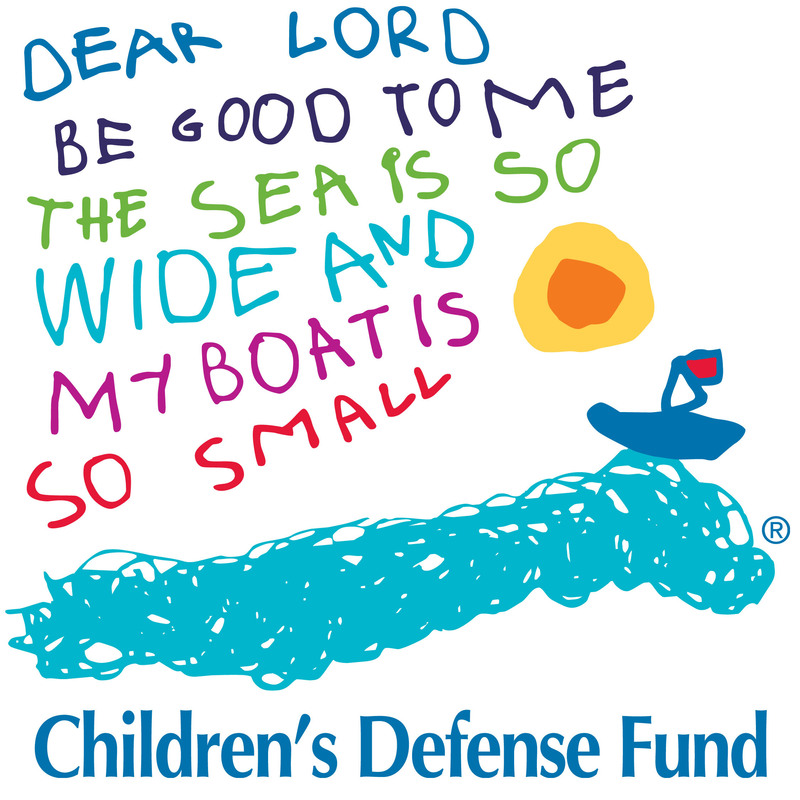 The Children’s Defense Fund (CDF) is a non-profit child advocacy organization that has worked relentlessly for over 35 years to ensure a level playing field for all children. We champion policies and programs that lift children out of poverty; protect them from abuse and neglect; and ensure their access to health care, quality education and a moral and spiritual foundation. Supported by foundation and corporate grants and individual donations, CDF advocates nationwide on behalf of children to ensure children are always a priority. This entry was posted in Children's Sabbath, Education, Prayers and tagged Children's Defense Fund, Children's Sabbath, Resources. Bookmark the permalink.